It is located right on Silver Lake which connects to Kalamazoo Lake and goes out to Lake Michigan. Enjoy the view from your deck, hot tub or the dock. It includes 2 Kayaks to enjoy the natural beauty of the lake and rivers. It also has a fire pit for enjoying the evenings. The lake is great for watersports as well as fishing. The house is about 1.5 miles from downtown Saugatuck. Paddle down to the dingy dock where you can tie up and walk around town or call the Interurban and be picked up and dropped off if you don't feel like driving or walking. Winter Activities: Snowmobiling, ice fishing and ice skating on the Lake are all fun in the Winter months. 2 Kayaks and paddles are included in rental. The accomodations are located down a hill from the parking and up an inside staircase. House includes a deck, dock, hot tub and a fire pit. Items listed under other services can be arranged at an additional fee We can help arrange paddle board or pontoon boat rental delivered right to the dock. Ask if you are interested. These items book up quickly so the earlier you ask, the more chance there will be availability for your rental dates. A great little place to get away and relax! Our family enjoyed our stay at the frog. It was great to be out on the water, we all enjoyed using the kayaks provided and paddling around the river. They also have a nice little fire pit right along the waterfront for you to use. The outside time here was a nice change. They also have a hot tub to relax in on the deck. The unit itself is small but provided all we needed, a equipped kitchen for making meals, a couple of bedrooms and a little family room. We spent time at Oval Beach and Saugatuck which are both very close by. Perfect for a quick getaway weekend with the girls! This place was clean, quiet, private, and had everything we needed for the weekend! We really loved the hot tub, and the location is great for getting around town! Would definitely stay here again. We Loved our Stay at the Frog! We wished we could've stayed longer. We only had a few nights for our honeymoon before we had to get back to reality and work. It was so peaceful. The property and managers were great. We might bring our family back and rent the bottom half of the house! Not handicapped accessible. Beach/ fire pit difficult to access. Need list of TV channels. People in main house very noisy. Parking not easily accessible to house. Thumbs up from 16 ladies! We rented the complete house (main house and the attached apartment...The Frog) for our annual sisters & cousins weekend. The views were beautiful! The house very well equipped! Only wish the weather had been better so we could have been outside more. We did have a lot of black ants in the kitchen and angry bees out by the trash cans, and spiders all over the deck....but we were are in the woods! Dana always responded with answers to our questions...she even knew which light switch controlled the hanging light over the pool table/dining table without having to come over. (for those wondering...its over by the staircase...flip the button and push the slide up). We're talking of returning next summer!! Exactly what we needed for our small family vacation! This was my family's first time vacationing in Michigan and we fell in love with Saugatuck. This rental space was exactly what we needed! Close location to so many things- dune rides, Oval Beach , Saugatuck/Douglas shops and restaurants. 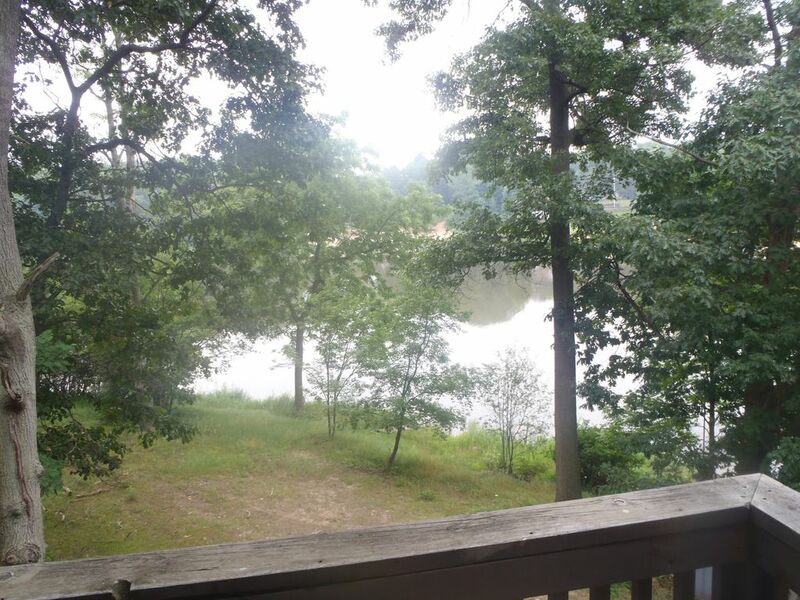 Private access to the river for swimming and kayaking and fire pit! The rental was very clean, and everything we needed and communication with the owner was prompt. We can't wait to come back! Saugatuck and Douglas are located among the towering white sand dunes on the shores of Lake Michigan and the Kalamazoo River. The area offers world-class beaches, boating, antiquing, golf, live theater, nightclubs, great restaurants, and a huge variety of art galleries and artists.